In 1920, Paul Klee famously wrote in his paper, Creative Credo, that “art does not reproduce the visible, rather, it makes visible”. The statement came as a testament to the artist’s belief that art should convey the metaphysical realm instead of the material world – and in his drive to achieve this, Klee experimented with numerous artistic techniques and colours, eschewing recognisable content for animated strokes and symbols that expressed both emotion and the unconscious. Elsa Duault, INSTANT 120-4, 2018. Acrylic on canvas, 120cm. All images courtesy of Berman Contemporary. Today, almost a century on, perhaps there is even more need for art to convey the metaphysical instead of the material. While humanity, nature, and technology become increasingly more interrelated, art is required to communicate these relationships and connections as a reflection of human emotion, thought and observation – discerning what otherwise may not easily be understood or felt, and making transformation visible. Inspired by Klee, concerned by her global environment, and set on making visible, is artist and explorer, Elsa Duault. 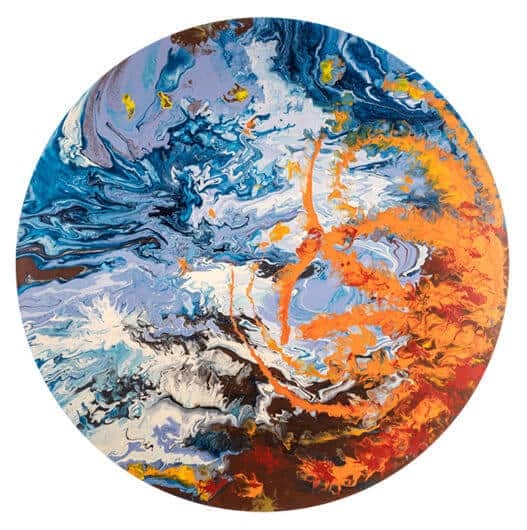 Represented by South African-based gallery – Berman Contemporary – Duault uses ‘molecular painting’ to abstract her connection to the world around her, and harnesses movement in attempt at presenting the multitudes of both time and society. 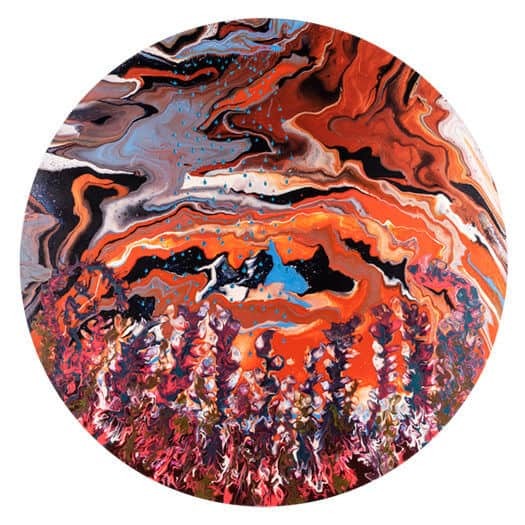 Moved by nature, Duault’s works are large-scale, circular swirls of acrylic paint – reminiscent of the ancient technique of Marbled Paper or Ebru – and find their articulation around several main axes: the density and ratio of materials; the interdependences of substances; motion and movement found in nature; texture; and the effervescence and temporal character of the creative process. Elsa Duault, INSTANT 120-2, 2018. Acrylic on canvas, 120cm. Courtesy of Berman Contemporary. In focusing her practice around these dynamics, Duault has created numerous visuals of energy colliding, expanding and contracting in a perpetual yet frozen motion. 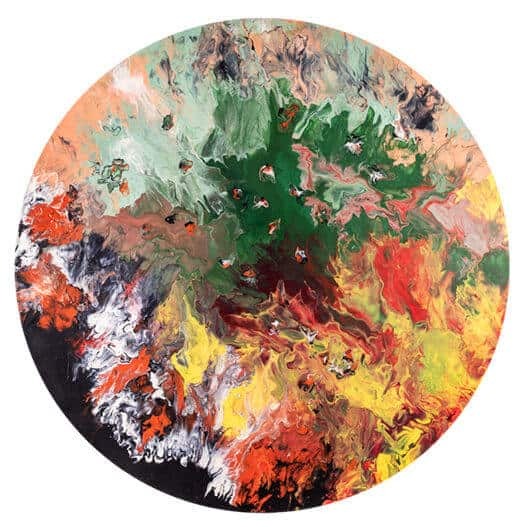 The paint mimics the flow of natural processes, at once exploring the many forces that mould our society and questioning the complex layers of contemporary life. They are a kinetic presentation of the chaos of equilibrium, and make visible the movement of paint over the axes of space and time. For Duault, her paintings are not static or inert objects, but rather the protagonists in a space – commanding and imposing on it, and demonstrating that all becoming is based on movement. Furthering her exploration into time, space, movement and the metaphysical, Duault has chosen to present her work across multiple time dimensions – inviting viewers to download and activate the application, Artivive. Designed to instantly connect artists, curators, collectors and art lovers, Artivive utilizes mobile social technology to not only reproduce the visible, but also make visible. Duault has yoked Artivive to offer a glimpse into the processes behind her work, evoking the cycle of life interwoven between humans, nature, technology and time. In doing so, there is the creation of her ‘molecular painting’, the filming of this creation, and the numerous and multiple times and places this film will be played over and over and over again. The work has transcended boundaries of both space and time, and is a testament to Klee’s statement that art does not reproduce the visible, but rather makes visible. The work also affirms, again, Klee’s understanding that all becoming is based on movement – space as a temporal concept. Elsa Duault, INSTANT 120-3, 2018. Acrylic on canvas, 120cm. All images courtesy of Berman Contemporary. Like Klee, Duault’s work eschews recognizable content for the animation of paint, expressing emotion and the unconscious, and allowing the visuals to become deeply meditative. After Antoine-Laurent de Lavoisier, “in nature nothing is lost, nothing is created, everything is transformed” – perhaps the driving force behind Klee’s portrayal of the metaphysical realm, and Duault’s subsequent harnessing of movement across painting, space and time. Duault’s work will be exhibted at the 2018 Turbine Art Fair, where with the application of Artivive, you can experience the artist in her studio. Download it at Artivive.co.uk, hold your phone-camera screen over any of Duault’s paintings, and witness the creation happening. Don’t forget to try it here too! FEATURED IMAGE: Elsa Duault, detail of INSTANT 120-4, 2018. Acrylic on canvas, 120cm. All images courtesy of Berman Contemporary.